Carpet is one of the least expensive floor covering options available, typically selling for far less than hardwood or natural stone. However, there's no doubt that it is still a significant expense for most homeowners (and renters, if your landlord won’t cover the cost). There are some ways to keep the cost down while still ensuring that you're getting a carpet that will suit your needs. For many, nylon is the first carpet fiber that comes to mind when they head out shopping. Nylon does have a long history of proving itself to be very durable and resilient and is the most popular synthetic fiber used in carpet. However, nylon is also the most expensive of the synthetic carpet fibers. 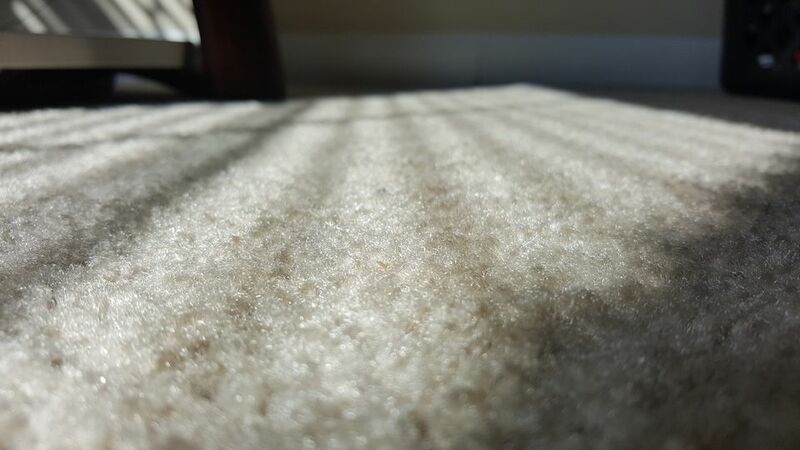 Consider choosing a less expensive fiber for your carpet. Polyester is a great middle-priced option. It has been around for a long time and, thanks to innovations, is more durable than it ever was before. Polyester is naturally stain-resistant and comes in a wide array of styles and colors. A big plus with polyester is that you can get much more vibrant colors than you can in nylon, due to the way the fiber accepts the dyes. Olefin (polypropylene) is one of the least expensive carpet fiber options. When made into a cut-pile (Saxony) carpet, it is best suited for low-traffic areas, as it is not very resilient. However, it is strongest in a looped form, such as in a Berber or in a level loop commercial style. In these styles, the olefin can stand up quite well to foot traffic, and it has the advantage of being as close to stain-proof as possible because olefin is solution dyed. Any style of carpet can last forever if you spend enough money on it. However, when working within a budget, it's important to choose a style that is durable even at the lower price points. For example, many Berbers offered at lower price points are still fairly durable. Berbers often cost less because of the olefin fiber content and the production process. All styles of carpet start out as looped. For cut-piles, the tips of the loops are sheared off. Obviously, Berbers do not need to undergo this step of the process, so they are less costly to produce. Why are Berbers considered to be so durable? It is because the strongest part of a fiber is the side, rather than the top. When a fiber is looped around, it is the side of the fiber that is exposed to foot traffic (because the “ends” are tucked into the backing). Therefore, you are always walking on the strongest part of the fiber. Frieze is another hardy style of carpet that will generally offer good durability at a lower price. Friezes consist of longer fibers that feature a high twist level, which increases the fiber strength. Additionally, because the fibers are longer, they tend to lean over to the side. This means that much of the foot traffic occurs on the side of the fibers, which, as we just learned, is a good thing. To help with your budget, avoid cut and loop styles. Generally, these styles are more expensive and not as durable as other styles mentioned above. Many carpet retailers carry inventory, with large rolls of carpet kept in their warehouse. Often, retailers will have purchased their inventory at discounted rates because they are buying in bulk. This translates into a better deal for you. You will usually be able to save some money by buying carpet a dealer already has on hand. Obviously, this means that you have a more limited selection in terms of the styles and colors offered. However, if you can find a product that you like that's already in stock, you will be able to save some money. If you are looking to carpet a small area, such as a bedroom or a family room, check to see if the dealer carries any carpet remnants. These are usually the ends of the large rolls that the dealer kept in inventory and are often discounted even further once the roll gets small enough that it can be sold as a remnant. Inquire if all of the in-stock products are first-quality goods. This means that they are the same product originally sold by the manufacturer and come with a full warranty. Sometimes, dealers may carry “seconds,” which means second-quality goods. These are not necessarily bad carpets. The most common reason for a carpet being deemed second-quality is color. If the dye process was off somehow and resulted in a carpet that did not match the sample color closely enough, the manufacturer can’t sell the carpet when customers order from the sample. However, there is nothing wrong with the carpet itself, so, the manufacturer will sell the product to a dealer at a deeply discounted rate. If the color works for you, then you can often score an even bigger deal on the carpet. Just be sure that the manufacturer’s warranty is in effect and that there is nothing wrong with the quality or performance of the carpet. It may seem illogical to spend more money on the carpet padding when you are actually trying to save money. However, the pad is extremely important to the overall performance of the carpet. A good underpad can make a lower-quality carpet perform better than it would on its own. When choosing the carpet cushion, purchase the most durable pad you can afford and offset the additional cost of the underpad by choosing a less expensive carpet. You don’t need to necessarily buy the highest grade of pad offered by the retailer. Some dealers carry "deluxe" pads that offer additional features, such as being made of memory foam or increasing the length of the manufacturer’s warranty. When working within a budget, you don’t need these extra features. Just look for a durable pad that is suitable for your use. Generally, we recommend bonded polyurethane foam underlay (commonly referred to as “rebond” or “chipfoam”) as it offers good value for your money spent. We recommend a minimum density of 8 pounds and a minimum thickness of 3/8 (0.375) inch for use under most carpets in most residential applications. An alternative to purchasing the carpet and underpad separately is to buy a carpet that has the pad already attached. A popular, contemporary version of this “all-in-one” product is the Kanga line of cushioned backing. It's available in a variety of carpet styles, and the polyurethane foam pad is adhered to the back of the carpet, thereby eliminating the need for a separate pad. These carpets are very budget-friendly. The cost of the carpet with the pad attached is generally less than the cost of purchasing the carpet and pad separately. In addition, the installation of carpet with attached padding is fairly simple, so you could save even more money by installing the carpet yourself. While we don’t recommend Kanga-backed carpets for use in high-traffic areas, they can be effectively used in areas such as basements, playrooms, or even rental units. They offer a low-cost option to the landlord or tenant and, if purchased by the tenant, can be easily removed and transported when the tenant moves out. Can You Vacuum SmartStrand Carpet?